Our fresh coat of paint has dried and we’ve refreshed the gallery at taste, complete with new work brimming with images of warm days and nights. Dora Atwater Millikin and Susan Strauss return to the gallery with bold and lively new work, just in time for summer. Be sure to stop by the gallery at taste, Monday through Friday from 9am to 5 pm, to view Dora’s and Susan’s new selection of paintings. Though not unfamiliar to our walls, we are pleased to show new work by the Massachusetts artist Dora Atwater Millikin. Known for her roadways, summer camper series and the geometry found in everyday life, we’re pleased to present a new series of early morning, evening and coastal scenes. “Ordinary, mundane objects are featured, not omitted, and the works are meant to engage scenes of contemporary life that transcends the everyday. My urban subjects depict objects associated with a more leisurely life and are in direct contrast to nature. Their titles such as “No Parking” or “Parking this side only” allude to the complicated network of rules and privileges installed to maintain order in an overly congested world. Also no stranger to the gallery at taste is Susan Strauss. Her loose, dynamic style captures the essence of the scene. Strauss brings a new set of small works featuring spring and summer hued landscapes to our gallery along with several large pieces that demand the center of attention. “Each new painting is fresh, open to risk and growth. I paint from direct observation of both inner and outer landscape. Simply put, I am painting to make visible both seen and non-visual experiences, to explore their interconnection and to reveal their universality. In other gallery news… summer Gallery Nights will be back on July 20th and August 17th. Mark your calendars! On July 20th, we’ll feature the layering, textural artist Coral Bourgeois and her mosaic collaged pieces, Kelly Jo Shows’s unique Portrait of an Artist shoe paintings, local artist Christian Potter Drury’s playful, eclectic story pieces, and Jessica Pisano, whom you may recall is a sought after seascape artist. Jessica’s new series features birds in flight in her highly crafted and articulated oil techniques. August 17th brings Debby Krim and The Colors of White photography study featuring the relationship between positive and negative space, Rhode Island artist Vanessa Piche who has added the Summer Tides and Gannett Summer boating series to her ever-popular shorelines and marsh paintings, Wendy Wahl’s 3D pieces made from unbound pages of discarded encyclopedias, and Tiffany Adams’ organic ceramic sculptures inspired by nature. Enjoy this glimpse of our current show with Dora Atwater Millikin and Susan Strauss or drop in anytime Monday – Friday between 9am – 5pm to view these stunning pieces in person. And as always, take advantage and “try before you buy” to view pieces in your home or office. It’s official! Spring has arrived. With warmer temperatures upon us, we’re lightening things up at taste. Over the next few weeks we’ll be taking our cue from nature and transforming our gallery with a fresh coat of paint, outdoor furnishings and bright pillow accents that complement our newest selection of paintings from Dora Atwater Millikin, Susan Strauss and Christian Potter Drury. For a little inspiration, take a look at this fresh living room we designed and installed in seven short days at Middletown’s Bancroft on the Bluffs for Newport Life Magazine earlier this Spring. Be sure to check out the two slideshows that illustrate the process of layering furnishings, art and accessories and bring Spring inside in your own home. Choosing a new piece of art can reenergize a room. Modern art by Diana Bunting (above the mantel) and Theresa Girard (over the sofa), are from Jessica Hagan Art + Design and bring in blues, mimicking the ocean view, and add a fresh perspective. Another way to lighten a wintery-warm atmosphere, is to add natural fiber pieces like these Maguire woven chairs, rattan side tables, raffia lamp shades (Newport Lamp & Shade) and a fun-patterned rug like this coral-infused Rustigian Rugs flat weave. The antique Biedermeier chair (lower right) mimics the natural fiber running throughout the room and adds a touch of elegance. Adding greenery like the bright orange vase of tulips (Secret Garden) on the Thibaut grasscloth coffee table is a great reminder of spring. Sometimes an unused corner lends itself well as a bar or writing desk (or both like the Hickory Chair game table we used below). Tuck freshly upholstered stools beneath a narrow desk or table, add a lamp (Hwang Bishop), a gilded tray, fresh fruit and a couple of refreshments and you have a great space to make drinks next time you have guests over. Don’t forget a focal point such as the “Green’s Pier” painting in this vignette. Here are a few more detailed glimpses of this fresh living room overlooking Second Beach. We enjoyed selecting classic pieces to ground the large space and provide a sense of permanence and were able to juxtapose history with textural elements but keep the overall appeal current by adding a parsons table and acrylic plant stand, mixing the old with the new. We repeated the use of blues and chartreuse by adding solid pillows to these lovely watercolor pillows on a neutral Hickory Chair sofa. Spring is in the air. (If you live in the Northeast like us, it takes a bit of imagination, but nonetheless, we’re in striking distance.) In anticipation of a classic New England summer, we’re adding more outdoor furnishing options to our cadre of resources. The past few months, we’ve met with Lane Ventures and Summit Furniture to learn more about their lines of furniture, finishes and fabric options and methods of construction. As a result, we’re adding both to our short list of preferred outdoor furnishing options. And – samples of each line will arrive in our gallery later this Spring, ready for ‘sit testing’. In addition to Lane Ventures and Summit, Janus et Cie, Kingsley Bate, Richardson-Allen and DEDON are at our fingertips to provide the right choice for each space. Perfect for the patio, pool or boat. Take a look, take a seat and get ready to take in the great outdoors this summer. 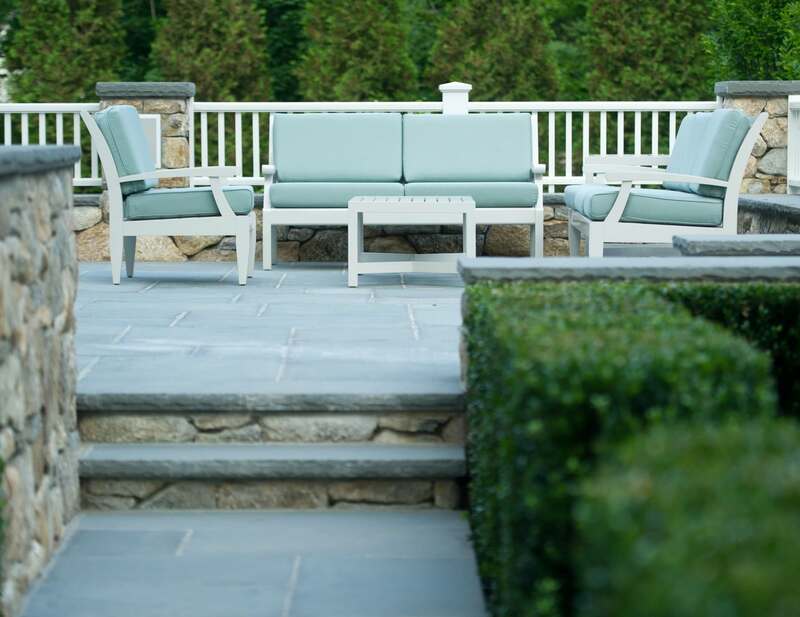 Teak, weather resistant wicker and tough powder coated steel choices from Lane Ventures. Classic teak, in fresh new designs, from Summit Furniture. Richardson Allen furnishings made just up the coast in Maine. North Carolina is home to numerous furniture fabricators, including one of our top choices for fine furnishings, Hickory Chair. This week, taste team member Wendi Dicely-Scalora had the pleasure of attending a unique program for designers. She and designers from across the country spent the week at the Hickory Chair factory to learn about the behind-the-scenes creative process and the craftsmanship put into each piece. Hickory Chair University allowed Wendi to view the process from prefab (the blueprints of the design) to leg creation, detail specifications, upholstery, base framing, shipping prep and, alas, the beautiful finished piece. She even had the pleasure of seeing the bare bones of one of our clients’ dining chairs before being sent for staining and upholstery. Enjoy this selection of photos taken during one of Wendi’s facility tours. So much handmade care and detail goes into each piece and I am both pleased and assured that Hickory Chair continues to be a great source for taste and our selections in fine furnishings that will last for generations. Years ago, taste designer Kevin Baker and I used Sketch-up with some success, yet often found the rough edges of the design program caused more concern with our clients than answered questions. After receiving several raised eyebrows during client meetings, we took a step back and returned to relying on CAD to work through and convey our ideas. taste designer Ashley DelVecchio renewed our confidence in the tool with her lightening fast speed and plug-in know how. She helped us turn rough sketches into well lit renderings – complete with wood finishes, tile selections and reflections in glass. Soon, we all began to rely on the program and the power it had to enrich our design process and help our clients envision— and build confidence in—our designs. Our progress continues and we have big plans for Sketch-up in 2017. Stay tuned as Julia Reinalda joins the ranks of savvy Sketch-up designers and Kevin expands the use of the program to convey construction details. A sampling of recent 3D renderings follow, to inspire and help envision your next project. Simple line drawings of a Kitchen island helped our clients imagine the functionality this additional cabinetry brought to their space. Renderings of this Kitchen helped us get the scale and detailing of this millwork design spot-on in this historic home. We intentionally restrained from adding additional color and material finishes so we could study the millwork profiles, without the distraction of other surfaces. We used this same monochromatic approach in this master bedroom. The lack of color helped us to study the millwork design, custom bed and additional natural light created by the mirrors on the wardrobe doors. Then, we used the same Sketch-up approach in the master bathroom at this client’s home. Larger and additional windows produced the abundant natural light our client wished for, and the renderings helped to confirm the positive outcome. Kevin has been collaborating with local architect Mary Meagher on a cottage renovation, including the addition of second floor dormers. To help our Chicago-based client understand the options, Kevin’s using Sketch-up to develop massing models that are emailed to our client for review and consideration. Ashley created these Sketch-up renderings of the cottage featured above, complete with artwork from the gallery at taste – patiently waiting to takes its place of honor at our client’s home this summer. I’m so pleased to have the work of Ben Anderson gracing our gallery, ready to share with fellow art appreciators. Thanks to a friend and loyal collector of Ben’s work who needed to downsize her art collection, we’ve acquired a vast and varied number of ceramic reliefs and plates. Among my favorites are Ben’s molds of a freshly caught fish, not unlike the Japanese fish printing process where a fish is rolled onto a soft paper. The glazing on his fish is luminous and perfectly slippery. I’m also lucky to have one of his crab and lobster plates too, inspired by the traditional Portuguese dish from Friends Market in Providence. Learn more about Ben and his series of highly charged compositions that remind us of the simple beauty found in living things. The following video features Ben Anderson at his studio. He gives a great explanation of his influences and process as an artist. Visit taste to view the following available pieces in person, or view the collection in our web-based gallery at www.tastedesigninc.com. Our gallery furnishings and art are available for our in-home “try it before you buy it” program. Taste designer Candace Langan has been working her yacht interior magic once again… For the past few months she’s been on a sprint to help our California-based client and new owner of a classic super yacht reinvigorate the vessel and personalize for his chapter of ownership. Our client acquired the then ‘Timoneer’ this summer and in addition to renaming her ‘Catalina’ he brought his western aesthetic to the 147′ yacht originally designed by Dubois Naval Architects with interiors by John Munford. How did we successfully blend our client’s request for a California-clean palette and polite insistence for “no blue, please” with a classic cherry yacht interior? Candace relied on a textured and neutralized palette with accents in tomato red and crisp browns to complement the rich wood tones. Blue and white carpet came out and was replaced with a subtly patterned geometric rug. Florals were replaced with a collection of small scale prints and textured fabrics. Tufting was removed and replaced with tight backs on sofas and headboards. Now, Catalina boasts a clean and textured canvas – ready for our client to personal with art and collections from his travels at sea. All aboard! Yacht management firm Jon Barrett and Associates oversaw the refresh of Catalina and the hull painting in a warm Benjamin Moore gray. Our client was so pleased with the new hull color we used it as a launching point for the interior color palette. The teak flooring was refinished and a new gray grout was installed to complement the stainless steel accents around the flush floor lights, railings and diamond inlays found in the upper salon. Candace developed a neutral upholstery palette with accents in tomato red and crisp brown tones to complement the cherry interior. The Upper Salon allows guests a near 360 degree view of the horizon, whether at anchor, surrounded by gorgeous Bahama-blue oceans and islands, or sailing to the next destination. Polished perfection from bow to stern…thanks to the new Catalina crew. Below deck, auburn throw pillows give the Main Salon warmth amidst the softer hues in the chevron gray and cream fabric selected for the curved sofa. Custom-made window treatments in a subtle monochromatic pattern echoes the eggshell-striped shades specially made to fit the brass light fixtures. The palette extends and evolves in the cabins, with warm red and leafy green accents. Cream and olive custom upholstered head and side boards makes for a serene atmosphere where guests can unwind in the evenings. The embroidered bedding from Sferra gives a luxurious feel to the stately guest cabins.